When exploring Royal National Park you can see a range of Aboriginal sites and artefacts. The best way to find out more about Aboriginal cultural heritage in the park is on a tour with an Aboriginal Discovery ranger. You might also spot one of the 80 historic remnants from the park’s Victorian-era establishment, including ornamental trees and residential remains. Connecting people, places and the past Celebrate the 2019 Australian Heritage Festival at Royal National Park, southern Sydney, in May. Come on a guided walking tour and learn about the history of Australia's oldest national park. Couranga walking track Vivid wildflowers pepper this medium walking track near Waterfall. Only an hour from Sydney, it offers several picnic spots and birdwatching opportunities. Lady Carrington Drive This historic cycling track near Audley and a short drive from Sydney follows the river and offers birdwatching, pretty picnic areas and history to explore. Who needs a gym? At Royal National Park you can hike, swim and row to your heart’s content. Hire a paddleboat from the Audley boatshed or surf the renowned Garie Beach. Jog along sandstone cliffs, attempt over 100km of walking tracks or try mountain biking the East Heathcote trails (be sure to note the ‘no sign–no ride’ policy). 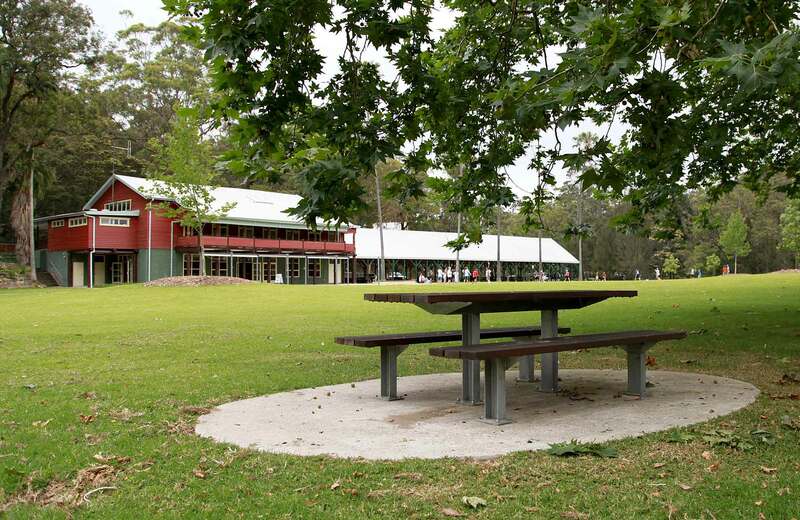 Located at Audley, just 32km from Sydney city, the park offers incredible beauty and natural diversity just minutes from the highway and train station. Spanning Port Hacking to Helensburgh, the park features multiple entry points and is well signposted, though it’s always a good idea to take a Royal National Park map. Bundeena Drive to Marley walk This rewarding walk from Bundeena Drive to Little Marley Beach leads through heath, past fresh water pools and creeks, and on to scenic beach views in Royal National Park. Garie Beach picnic area A perfect day out, Garie Beach is a wonderful place to enjoy a picnic and is great for swimming, whale watching, fishing, surfing and walking options. The park was one of Australia’s first areas of land set aside for conservation. In this natural haven, open ocean, sandstone cliffs and wetlands meet grassy woodland, rainforests, coastal heathland and eucalypt forests. You’ll also find some significant geological sites, including fascinating beach ridges at Cabbage Tree Basin. Curra Moors loop track A challenging walk through heath and waterfalls, the Curra Moors loop track offers scenic sandstone cliff and coastal views, waterfalls and great birdwatching. Palm Jungle loop track A challenging yet spectacular walk, Palm Jungle loop track takes in rainforest, cliff tops, beaches and scenic coastal views in Royal National Park, near Otford. Many visitors regularly spot native wildlife in the Hacking River Valley area, so keep an eye out for possums, sugar gliders and wallabies. This Sydney park is also home to a huge number of bats, amphibians and reptiles. Plus, birdwatchers are in luck - over 300 bird species have been recorded here, look out for sulphur-crested cockatoos, crimson rosellas, yellow-tailed black cockatoos and rainbow lorikeets. Living world wet and dry environments This Stage 1 excursion in Royal National Park, southern Sydney, gives students first-hand experience exploring the living world. It aligns with the Science and Technology K-6 Syllabus. Living world wildtracker: Audley This Stage 1 excursion in Royal National Park gives your students first-hand experience in exploring the living world. It aligns with the Science and Technology K-6 Syllabus. WilderQuest WildTracker Come on a WilderQuest WildTracker excursion designed for Stage 2 students focusing on science and technology. Carry out investigations to explore the living world in this part of Royal National Park.